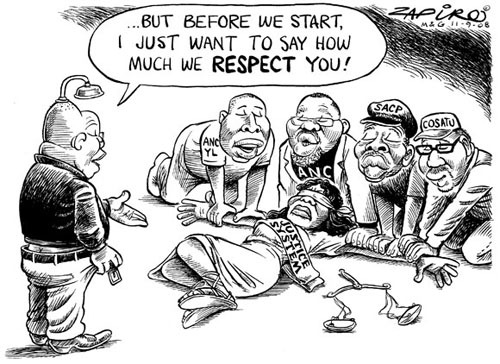 Published last week, the cartoon by Zapiro reproduced above has caused strong controversy in South Africa, indicting as it does not only ANC president Jacob Zuma and his allies, but implicitly the country’s justice system, which in a chillingly poignant twist of events has just thrown out of court on procedural grounds the charges of corruption that have followed Zuma for years. Conveniently Zuma, who has on several previous occasions sued Zapiro over his caricatures of him, now emphasises the importance of the freedom of the press, which probably means that the present kerfuffle will blow over, and is probably a good sign that no legal action will be taken, but simultaneously underscores the hypocritical nature of the most powerful man in, and virtually certain coming president of, South Africa. The cartoon is shocking in its imagery, and has of course provoked the requisite bogus charges of racism on the part of the cartoonist from the ANC Youth League and others, but it also deals in hard truths about a populist political figure whose career has been dogged by corruption charges and chillingly opportunistic politics. Zapiro for example routinely — and hilariously — depicts him with the shower hose over his head in reference to his stunningly irresponsible comments on HIV and showering as a ward against the virus that plagues this particular country like few others. The cartoon is a crass indictment of a crass politician and his equally crass allies in a cutthroat political environment. Zuma’s claim that the charges against him are all the result of a conspiracy against him, masterminded by his opponents in the ANC and elsewhere, though probably true to an extent, seem deplorably insufficient in explaining what seems like consistently problematic paralegal behaviour. Although the current dismissal is technical and thus finite, Zapiro’s comment, as crassly stated as it may be, seems to this outsider entirely justified. “The cartoon really shocked me when I first saw it. Not that I think it is an immorally outrageous cartoon — i thought it accurately portrayed Zuma and his cronies for the self-serving slime bags which they are — but more because it opens the way for retaliatory depictions (cartoons or otherwise) of the centre and the right in a similar (violent) light. As whites are mainly in these camps, you could get a kind of racial violence manifesting itself at the level of popular culture — something which a country like South Africa doesn’t need right now (or ever). Although the cartoon is not racist, hot-heads in the ANC Youth League are already claiming it is (a cheap ploy often used by the ANC to defer criticism from white and “puppet-of-white” critics). What you don’t want now is a bunch of misconceived, retaliatory cartoons depicting whites (or any other consciously depicted ethnic group) in a violent manner. Listen to Zapiro defend his cartoon here, and do read this passionate and cogent defense of it. And check out the Zapiro archive at Mail & Guardian online as well as Zapiro’s website, which follows the case as it develops.